After three consecutive years of increasing deal volume and value, private equity interest in US cybersecurity took a plunge in 2017. While firms like KKR and TPG Capital still executed billion-dollar deals with companies like Optiv Security and McAfee, respectively, what had seemed like an inexorable climb for overall PE activity in the sector at last started to slow. But the climb has begun again in the early months of 2018. 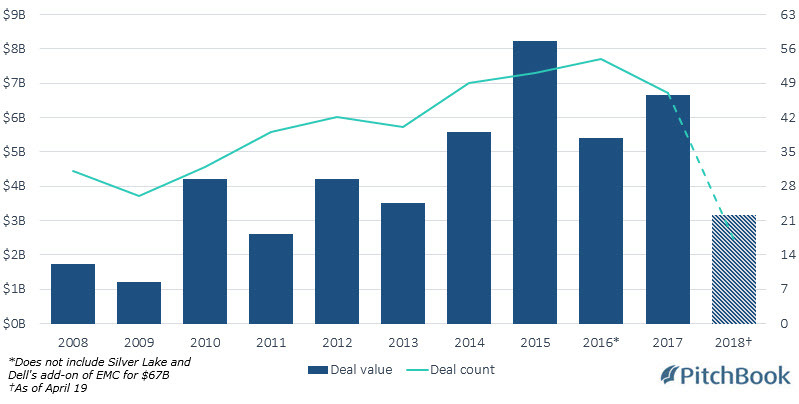 Private equity investors are on pace to establish a new decade-high in cybersecurity deals this year, per PitchBook data, and transaction value is on track to exceed any year except for 2016, when Silver Lake and Dell acquired EMC for a whopping $67 billion in what was far and away the largest PE deal the space has seen. Things are perking up on a quarterly basis, too. US cybersecurity deal count fell relatively steadily between 4Q 2016 and 4Q 2017, from 17 deals per quarter to 10. In 1Q 2018, however, that figured spiked back up to 14 transactions, a figure that's only been topped five times since the start of 2009. Within the US, two geographic areas are clear leaders in the cybersecurity space: the West Coast and the Mid-Atlantic. Between 2015 and 2017, those two regions accounted for nearly 57% of all stateside private equity investments in cybersecurity, while no other area was home to more than 11%. It's perhaps little surprise that cities like San Francisco, Seattle and New York are home to more than their fair share of cutting-edge software companies. 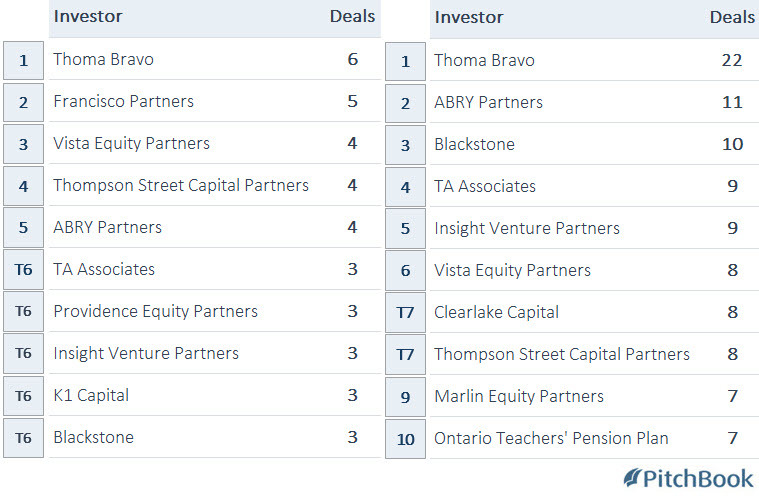 There are also few surprises on a list of busiest PE investors in space. Most of the firms that are most active in cybersecurity are noted software specialists, such as Thoma Bravo and Vista Equity Partners, which were early adherents to the gospel of tech in an industry that's often staunchly traditional, as we covered in previous editions of our Investor Spotlight. In addition to being the industry's top firm in terms of volume over both the past three years and the past decade, Thoma Bravo was also responsible for the biggest cybersecurity deal of this year to date. In February, the Chicago-based outfit completed its acquisition of Barracuda Networks in an all-cash transaction valued at $1.6 billion. Barracuda is a provider of cloud-enabled IT services to organizations and other subscribers, with a focus on protecting networks and data. February also played host to another major deal in the space this year, when Pamplona Capital Management and BlackRock acquired PhishMe, which defends against phishing attacks, at a valuation of $400 million. Now known as Cofense, the company had raised some $58 million in prior VC backing, reaching a $198 million valuation in 2016. We've got more cybersecurity coverage.